Repeat group with Google sheets - how to do it? I am trying to experiment with Sheets as the server, all seems to be running smoothly except for the repeat group. I gather this functionality now exists but I am not sure what I need to do to actually make it work. Do I need to create a separate sheet, or tab in the existing submission sheet, to receive the data from the repeat group? And do I need to put the separate "submission URL" for this sheet somewhere in my original XLS/XML? If so - where? No, you do not have to create separate sheet. When you download the data in .CSV file or Excel file, data from repeat group will be in different sheet but in same CSV file or Excel file. Everything works automatically and new sheets for (repeat groups) are created automatically as well during uploading. Just create a test form and try it out if you need. Maybe it is not the editable sharing link for the target sheet. Rather copy the url of the target sheet from the address bar (current url) at the top of yr browser (when you are at that sheet). Good luck! This functionality is awesome. My next learn is to find out how to join the repeats back into their parent survey to make a long version of the survey. The reason is to relate common fields to each individual in the household. I think there must be an east Sheets formula. Thanks for your replies... but - still struggling! I have a form with a single repeat group. The main form data uploads to Google Sheets just fine, but the repeat group data is nowhere to be seen. @Grzesiek2010 - it does't create anything automatically. I kind of hoped that it would. Could it be that ODK app doesn't have sufficient permissions to modify the Google drive? I'm still having absolutely no success with this - using Google Sheets for a form with repeat groups. regular data uploads fine into the "submissions" Google sheet, but any data inside a repeat group just disappears off the face of the earth. I get "upload success" message from ODK collect - and no error messages from ODK app, nor any odd notification from Google. I have set "sharing" preference for the folder in which the ODK forms and submission sheets such that anyone with link "can edit". I have uninstalled and re-installed ODK collect (v1.16.4), and given it every permission it asks for on my phone. Does the submissions form have to be in Google drive root? Could the issue be that my phone is connected to 2 different Google accounts? The settings in ODK, are for only one Google account, obviously. Is there a way to create the sub-sheets myself, and direct repeat groups to have their own submission URL to these sheets?? Or is it that repeat groups and google only work in a very specific set of circumstances, for the chosen few? Only the first sheet in the calc document is created. In the first sheet, I can see a formula like yours showing "error". You can see only one sheet in my google document. Note that I have another form, with a single "repeat 3 times", it works perfectly in the other one. I have been facing this exact same problem. Would you mind explaining how you solved it? 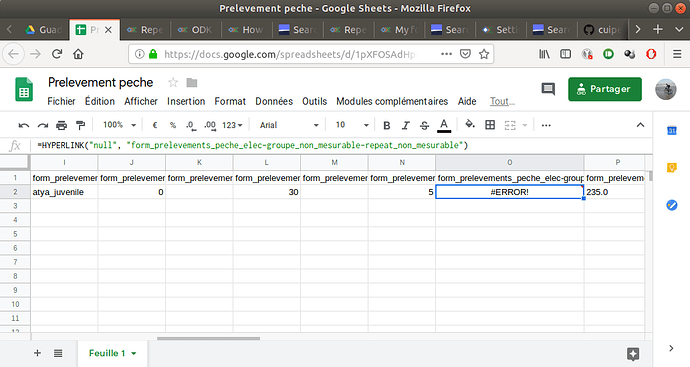 Have you created another sheet named "form_prelevements_peche..." in the same place of this sheet? I'm going to investigate the issue. It would be good if you can attach your forms, it's always helpful. Edit: I have mistakenly uploaded the xlm file. Thanks for your forms, it was very helpful. I was able to track down the root problem and prepared a solution. You can expect the bug to be fixed in the upcoming v1.20. We've fixed this bug in ODK Collect v1.20 Beta, @prvsct. Can you give it a try? Thank you Grzegorz and Yaw. I couldn't imagine the fix would come so quickly. I will gladly test the v1.20 Beta and report any trouble. What I tend to do is to add calculated fields into the repeat that simply add the common data I to the repeat (therefore I don't need to link back).